The new HRW estimate, which was based on testimony from a survivor and analyses of videos and satellite imagery, was triple the death toll HRW had reported at the end of June. The group said the imagery confirmed the existence of three more mass execution sites in and around Tikrit in addition to the two it had reported earlier. The United Nations Human Rights Council voted Monday to send a fact-finding team to Iraq to investigate possible war crimes by ISIS. “The reports we have received reveal acts of inhumanity on an unimaginable scale,” Flavia Pansieri, the deputy high commissioner for human rights, told the Council. The grisly video, which is certain to add pressure on the Obama administration to expand recent U.S. airstrikes against ISIS to include targets in Syria, as well as in Iraq, followed the release of a video of the beheading by ISIS two weeks ago of another U.S. reporter, James Foley. It also came after an emotional videotaped appeal aired last week by Sotloff’s mother to ISIS’ leader, Abu Bakr al-Baghdadi, to spare her son. 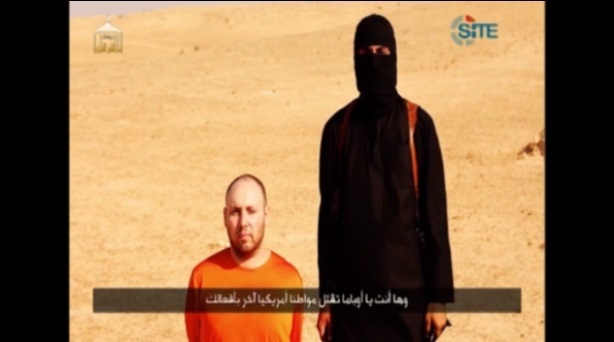 Sotloff had appeared in the Foley video, with the purported executioner, who is believed to be a British national, warning that Sotloff would be next to be killed unless Obama ceased conducting air strikes against ISIS positions around Mt. Zinjar and convoys approaching Erbil, the capital of Kurdistan. Obama, however, has since broadened the U.S. target list. Dozens of air strikes have been carried out in coordination with ground attacks by Iraqi special forces, Shi’a militias, and Kurdish peshmerga fighters in a counteroffensive that initially recaptured the giant Mosul dam from ISIS forces and, more recently, reportedly broke the group’s siege of the largely Shi’a Turkomen town of Amerli. “We take this opportunity to warn those governments that enter this evil alliance of America against the Islamic State to back off and leave our people alone,” he added, while standing over yet another unidentified captive who is believed to be a British citizen. Obama, who left Tuesday for the NATO summit in Wales later this week, is expected to urge other members of the alliance to adopt a coordinated strategy of diplomatic, economic, and military pressure against ISIS, which spread from its base in eastern Syria into Iraq’s Al-Anbar province in early 2014 before its sweep down the Tigris and Euphrates river valleys into northern and central Iraq beginning in June. Among other measures, Washington wants its European allies to adhere to U.S. and British policies against ransom payments to free citizens who are captured by ISIS – a practice that has reportedly become a major source of income for the group. Secretary of State John Kerry and Pentagon chief Chuck Hagel are also scheduled to visit key allies in the Middle East next week, especially in the Sunni-led Gulf states, to persuade them to crack down harder against their citizens who fund or otherwise support ISIS, offer greater support to a new government in Baghdad, and possibly contribute direct support for expanded international military efforts against the group. Like the administration itself, U.S. lawmakers, who return here from their summer recess next week, are divided on how aggressively Washington should take military action against ISIS. While many Republicans are urging Obama to conduct air strikes – and even deploy ground forces – against the group in Syria, as well as Iraq, many Democrats are concerned that such an escalation could well lead to Washington’s becoming bogged down in yet more Middle Eastern conflicts. Some key Democrats, however, are becoming more hawkish, a process that is likely to strengthen as a result of Sotloff’s execution. “Let there be no doubt we must go after ISIS right away because the U.S. is the only one that can put together a coalition to stop this group that’s intent on barbaric cruelty,” said Florida Sen. Bill Nelson Tuesday in announcing legislation that would give Obama legal authority to strike ISIS in Syria. In its report, Amnesty detailed mass killings last month by ISIS forces of hundreds of non-Sunni Muslim men and boys as young as 12 in the predominantly Yazidi regions in Nineveh Province, as well as the mass abductions of women and children, many of whom, according to the report, are being held in Mosul, Tal ‘Afar, and Bi’aj under pressure to convert to Sunni Islam. Many others remain unaccounted for. “The Islamic State is carrying out despicable crimes and has transformed rural areas of Sinjar into blood-soaked killing fields in its brutal campaign to obliterate all trade of non-Arabs and non-Sunni Muslims,” said Donatella Rovera, Amnesty’s senior crisis response adviser currently based in northern Iraq. In addition to Yezidis, targeted groups include Assyrian Christians, Turkmen Shi’a, Shabak Shi’a, Kakai and Sabean Manaeans, as well as many Arabs and Sunni Muslims who are believed to oppose ISIS, according to the report which also called for Iraq’s government to disband Shi’a militias, some of which are believed to have targeted Sunni communities in the region. “Instead of aggravating the fighting by either turning a blind eye to sectarian militias or arming Shi’a militias against the Islamic State as the authorities have done so far, Iraq’s government should focus on protecting all civilians regardless of their ethnicity or religion,” according to Rovera. The ineptitude of the Western world cannotbe more emphasized. That superpowers and other sovereign states are cowering as thugs run amok beheading people like they were slaughter animals underlines how the world depraved has become.